I am Cheryl Gorey and I live north of Mackay, Central Queensland, Australia. 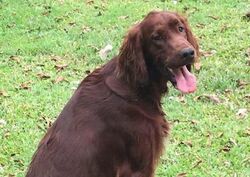 I have owned and loved Irish Setters since 1988 when I got my first male Irish from Mary Clarke and Norm Clarke from the Rhuboda Kennel in Brisbane, Queensland. I then also bought a female from Rhuboda and bred my first litter in 1992. 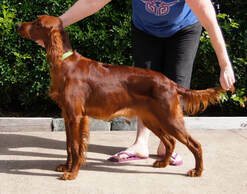 ​Since then I have owned Irish Setters from the Kelliher, Brazenwinds, Linleymvorne and Nanyima Kennels. ​After many years, our long awaited litter from our beautiful Miss Bridget (our special girl from the Millcroft Kennel in England - Aus Ch. 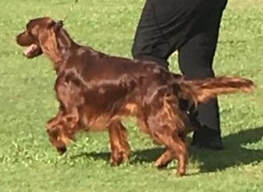 Millcroft Moon Dreamer Imp UK) came true on 13 November, 2013 with a lovely litter of 6 beautiful puppies, her daughters Charlot and Meg were kept at home and are part of our breeding program. 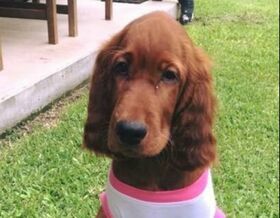 We have since imported our lovely boy Flynn (Aus Ch. Millcroft Fly Over The Moon Imp UK) as well from the Millcroft Kennel. We have bred on from our beautiful girls Meg and Charlot and we have also had another litter with Bridget in 2016 which we kept our beautiful Gabriel. Charlot's litter has given us the lovable Linkin and the beautiful Pippa. We have plans for 2018 to breed Charlot to another boy. Plans yet to be finalised.